Roger Durham Hannay (1930-2006) was a member of ASCAP and has received grants from the National Endowment for the Arts, the North Carolina Arts Council, ASCAP, the American Music Center, the Kenan Foundation, the Pogue Foundation, Meet the Composer Inc., the University Research Council, and the UNC Micro Computer Support Center. He had invited residencies at the Tanglewood Music Center, Princeton University Center for Advanced Studies, the University of Indiana, the MacDowell Colony (1982), the Charles Ives Center for American Music (1985), the Virginia Center for the Creative Arts (1992), the Centrum Foundation (1992), and Yaddo (1992). He was a member of the Southeastern Composers League and his music is published by C.F. Peters, Galaxy Music Corp. (E.C. Schirmer), Seesaw Music Corp., Media Press, and Accura Music Inc. The diversity of his work as a composer and advocate of new music by others has been reviewed in Musical America (Hi-Fidelity) and the New York Times, and he is cited in Baker's Biographical Dictionary of Music since 1900 (Slonimsky), the New Groves, the New Groves Dictionary of American Music, Groves Dictionary of Opera (1992), Baker's Biographical Dictionary of Musicians and American Composers (Ewen). His orchestral compositions have had performances by the Eastman-Rochester Orchestra, the Houston Symphony, the North Carolina Symphony, the Greensboro Symphony, the Winston-Salem Symphony, the Eastman Philharmonic, the New York Composer's Theatre Orchestra, the Durham Choral Society and Orchestra, the UNC Symphony, the University of Kentucky Symphony (Lexington), the Indiana University Symphony and the Fargo-Moorhead Symphony. Roger Hannay is Professor Emeritus of the faculty at the University of North Carolina in Chapel Hill where he was the Founder-Director of the UNC New Music Ensemble, the Composer-Concert Series, and the Electronic Music Studio. 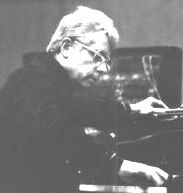 He served as Chairman of the Division of Fine Arts and from 1966 to 1995 was Professor of Composition lecturing in theory and contemporary music in the Department of Music. His book, a collection of autobiographical essays "My Book of Life" was completed in September of 1997.